Hi! I'm trying to teach a trick to my baby sun conure. I want to pick him up like a telephone, and cusp him in my hands while holding him up to my ear, pretending that he's a telephone receiver for a quick second. He doesn't really like to go on his back and I can sometimes convince him to do it if I cuddle him and pet him on his tummy right. He also doesn't like to go upsidedown! I have no idea how to teach him to do a flip. Do you have any advice on how I can do this? He does have a favorite treat that he will do head dives for... papayas of coure! how long have you had him. Myrtle flips on her back while on my lap to foot fight. That is the only time she does it for me but upside down is a normal position while playing. liz wrote: Welcome to the forum. I'm sorry I barely gave you any information. So Kouki turned 6 months old yesterday, and I have had him for about 3 months now (as soon as he could eat on his own). On a daily basis I feed him Harrison's Bird Food (organic fine pellets), a quarter of an apples, 2-3 small papaya cubes, one nutriberry (on the weekends). I don't think the nutriberries are organic but the other 3 foods are! And he is only in his cage when he is sleeping. He stays on the sticks that I've arranged above his cage unless I move him off it. I get up in the mornings at around 6:30AM or so, I take him out of his cage and we cuddle in bed for 20-30 minutes. He likes to play, or fall asleep and just get real warm and snuggly! I usually stay awake, staring at him in wonder. Then I return him back to the top of his cage and let him take a big poop. I put out his food (about half a tablespoon). Sometimes I'll give him dried papaya or a quarter of a fresh apple with his food if I have enough time in the mornings. From what I have learned on the weekends, he spreads his breakfast throughout the entire morning. I leave home at 7:30AM to go to class at 8:00AM. Sometimes I come back before noon and give him lunch (about half a tablespoon). One day in the week I have to leave him from 7:30AM-6:30PM but my schedule will change soon. He gets food late that day. In the mornings, my roommates are usually home and they tell me he's pretty quiet. Sometimes he plays with paper/sticks. He can be noisy right after I leave (or first thing in the morning when I walk out of my room), he gets separation anxiety! But it's been getting better because have not reinforced it at all. When I come home, sometimes I like to nap and so I play with him in my bed, and then we nap together (I know, I need to be very careful!!). If I have time (and I haven't these past few weeks), I do tricks with him in the evening after dinner. He loves the fruit-blend banana pellet-thingies that I pick out from the little jar of mix that the breeder gave me, and I consider them small treats (if I put them with his regular food, he bypasses all the seeds and pellets and goes for the fruit blend). I taught him how to spread his little wings, kiss, touch the tip of my chopstick, but I haven't had time to teach him much else. And then after we're done with tricks, I'll give him a big treat like a papaya. That's pretty much it! He hangs around while I do homework, and he goes into his cage for bed at around 11PM. I don't have anything to cover his cage (yet? ), he has a little snuggle hut! For dinners or weekends, I sometimes let him have lentils, rice, egg whites, or the inside of peas if that's what I'm having. One time he was in the kitchen with me when he decided to try some raw onion I was chopping I feel like he has been more shy about new foods ever since. ---on the weekends I like to take him out for walks in the morning if I have time; he usually just stays perched on my finger, he doesn't like to fly off it often, especially when he is outside! Please don't take this wrong as I have a tendency to speak first about the areas that I think need some improvement. I looked over the ingredients in the Harrisons Power treats and except for the added vitamins and mineral and the fact that it is a processed cube I have no problems with the product. The reasons for my objections are basically that as a processed cube it is way to dry for what the bird is designed to eat as their natural diet would contain about 75% moisture so the level of dryness in the cubes can contribute to a mild dehydration in the bird itself. Also the cooking of the ingredients, especially to produce this level of dryness destroys many of the naturally occurring vitamins and minerals which is why they try to replace them with the artificial ones. It also destroys other nutrients that they can not replace. The added vitamins and minerals can not be used by the birds body in the same manner as with the naturally occurring ones. Then I would also feed them differently than how you are feeding them, mostly in the time of day that they are given. Right now it is time for me to feed my birds their breakfast, so I am going to feed them and will return shortly and continue with this. You should also do more research into the diet and nutrition for your bird, you will find several topics on foods such as chop, gloop and raw foods for your bird in the diet, health and nutrition section of this forum that I recommend that you read for a start. You will find, in addition, to the things that I have said that the majority of us do not really recommend the feeding of pellets to birds as we feel for the most part that they are a convenience for the bird owner, but are just not all that good for your birds. For now, this is all that I will say about your choice of foods, leaving that for you to research more on your own, I will however suggest some differences in how you are feeding the ones that you are using. 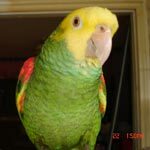 All of what I am saying will be tied into your training question before I am done as all of what I have said and what I am going to say affect how well your bird behaves as a whole and how well he responds to your efforts at training him, especially for trick training. Lets continue with your birds schedules, You bird and indeed all birds are photoperiodic which is simply a big word stating that your bird reacts to light. Some of these things have an effect on the way that your bird responds to you as a whole. One such thing is the birds breeding cycle and another is the cycle of replacing its feathers which is called molting. Your bird is a little bit young to experience the full impact of effects from their breeding cycle as they are not sexually mature until they reach 2 years of age, although young sun conures have been known to form monogamous pairs as early as 4 to 5 months of age. The first time that they will experience the full impact of the breeding cycle is when they go through puberty and become sexually mature. One of the effects of the onset of puberty is often an increase in how aggressive they become during the transition from juvenile to adult bird and another will be a change in their personality. The increase in aggressive behavior is temporary and only remains in effect while the birds level of sexual hormones remains high, but the change in personality is permanent and also changes the manner in which they bond with you their human. The level of protein in your birds diet also affects how aggressive your bird is because some of the excessive protein is used in the manufacture of hormones. Now the triggers for their breeding cycle are protein and the abundance of food and the light or solar radiation that they receive on a daily basis as either of these can cause your bird to go into breeding condition or to remain in breeding condition and this is partly because of the effect of light on the birds internal biological clock, which is the primary trigger for the bird to begin to produce the hormones related to reproduction. This biological clock is regulated by the light that occurs at two specific times of the day. These are the twilight periods that occur at dawn and again at dusk each day. These two times could be regarded much like the start/ stop button on a stop watch as they trigger the start and the end of the measurement of they length of the day/ night periods of the day which is used to trigger the right time for reproduction in your bird. This also means that artificial lights can override the effects of the solar light that controls the biological clock so that it no longer works effectively to control the reproductive cycle and that means that your bird remains in breeding condition. A very important thing occurs with a bird that is in breeding condition either due to solar radiation or due to the level of hormones remaining too high because of too much protein in their diet. This is that the birds internal sexual organs which begin at about the size of a green pea in a bird the size of an African Grey, begin to grow when the level of hormones increases and they grow to more than 100 times their normal size, but then when the level of hormones remains high they continue to grow and so the internal pressure on the sexual organs and the organs near them in the birds body increases as well and this results in excruciating levels of pain. This level of pain increases the level of aggression in the bird. As the length of time that the hormones remain high increases so does the length of time that the organs continue to grow larger. As these organs increase in size so does the amount of pain that the bird experiences and the more pain that is experienced, the more irritable and aggressive that the bird becomes. Over time the bird will experience so much pain that it can not tolerate being touched anywhere on its body and will also begin to pluck its feathers out and self mutilate in the effort to reduce the pain as well as biting anyone that tries to touch the bird. Now as far as your birds schedules go this simply means that your bird needs to wake up near dawn or sunrise at the latest with no artificial lights being turned on until after sun rise and lights off just before dusk so that the bird is exposed to the full effects of the two twilight periods and then the bird should be asleep by the time of full dark. So keeping the bird up until 11 pm is not good for your bird and a lack of good sleep as well as not enough sleep will make your bird more irritable and more aggressive and reduce your ability to train your bird as well as interfering with you having a good relationship with your bird. These negative effects may not be apparent in these early stages but will increase in severity over time and especially after the bird goes through puberty. This means that this is something that you really need to research about your bird. Back to diet and more specifically feeding schedule for your bird. I think that the easiest way to approach this is to begin by sharing with you what and how I feed my birds. My birds sleep uncovered and this works really well for me because I live out in the country so there is no artificial light to interfere with their sleep at night or to interfere with them receiving the full benefits of the twilight period at dawn. They then wake up shortly after dawn and before sunrise. I am wording this in relation to dawn sunrise, dusk and full dark and am doing this as the clock times will vary according to the time of the year, but the timing of what I do remains consistent with these events. Within the first hour of them waking up I give them breakfast, which for my birds consists of a fresh raw fruit, a fresh raw vegetable and a fresh raw leafy green and gloop. My birds receive enough of these foods for all day foraging as well as for their breakfast. If you do not choose to make and use gloop for your bird, you could use a food such as chop for breakfast and all day foraging. Then about an hour before dark or near the beginning of dusk I feed my birds a quality seed mix with a tree nut or so depending on the nutritional requirements of the bird as well as its size. and then my birds are asleep by full dark. You could use your pellets instead of the seed mix that I use. I remove my seed mix after my birds go to sleep each night which is also what you should do if you use pellets. This is because both my seed mix and your pellets are a high protein food source. I use almonds as the main treat for my birds you could use the same of a different tree nut, a roasted, unsalted peanut or some other high protein food. The best times to train your bird are after they eat their breakfast and before their mid day nap, as most parrots will take a short nap in the middle of the day, and then again in the afternoon or early evening before dusk. There is also a short period before they eat breakfast that could be used effectively for training. The reason that these times are normally the best times for training is due the normal eating habits of your bird. Most parrots eat and drink at breakfast and then again at dinnertime which times occur shortly after sunrise and about or just before dusk in the evening. They do eat some food during the remainder of the day, but mostly twice a day and so the times that I mentioned for training are the times that they are most receptive to accepting treats for training. You said that your bird likes to come to you first thing in the morning before he eats breakfast and that he likes to snuggle and cuddle with you at this time which makes it a wonderful time to practice laying on his back, since he is already at least halfway there. Rarely is it that a breeder or a pet store weans a young parrot to the foods that it should be eating. They all barely manage to wean them to either seeds or pellets, but then they do not tell a new owner anything about the diet that the parrot should be taught to eat or even that they need to be taught to eat these foods, they do not tell them anything about the parrots life cycle or what to expect with their new bird when they bring it home or when it reaches the time of puberty. They just want to sell the bird and do not care about any more than that, as a general rule. The way to teach your bird to accept and eat the fruits and vegetables is to eat them yourself in front of him before they eat anything else in the morning or before giving them dinner as long as you remove the all day food a couple of hours before dinnertime. Then you sit down with the fruit and / or vegetables cut into bite sized pieces for you with a few pieces cut even smaller for the bird, You then start eating the food in front of the bird. You really need to make noises to let the bird know that this food is really very, very good to eat, also tell the bird how good it is. your bird will eventually learn what good means both in behavior and in food and your bird also understands your tones so make it believable to him when you tell him how good it is. Now here is the kicker to this, you want the bird either in the cage with the door open so that he can come to you or on a table in front of you. Now in either way you do not want to offer him any of the food, you just want to eat it while telling him how good it is, act as if it is so good that you are going to eat it all yourself. This might take a couple of times but eventually he will start asking you for a piece of the food, do not give it to him, his next thing will be to start begging for it, but again do not offer him any of it then he will try to steal some of it and when he does make sure that the food that you prepared for him is closest to him so that he can steal it from you, let him do this and make sure that he is successful in stealing this food. He may just throw the food down when he steal it but if you are patient and keep using this method he will begin to eat it sooner than using any other method. There are several reasons for using this method and for its success, beginning with the fact that this is how the parent bird in the wild teaches them what to eat. Then there is the fact that parrots learn by watching each other or you. Eating is a bonding activity and a social event for a parrot and this is also part of the reason for this method working. Now as far as I am aware of this is the best way to teach your bird to eat the foods that it needs in order to remain healthy, so do not give up on doing this. Because of the birds not being taught these things and the fact that many of us have rescued birds or birds that had other owners this is an ongoing process that lasts sometimes for years on any one food. Also when changing your birds diet you must start off slowly and when you decide what you want to feed as your basic diet we will be happy to help you out on how to switch them over. Sorry I'm not responding, it's finals week for me and I am flooded with work! I will get back to you to let you know how his dietary changes are going. I will be more thorough next week with more time to respond properly. On Sunday, I made gloop with many of the ingredients which I already had in the pantry. Gloop just makes sense! When I have time I will go to the bulk section for the other grains (I grocery shop every other day except for these past 2 weeks (so busy!!!). So far Kouki really loves the cooked food, and he finishes all of it. He has liked to eat what I eat in the past, so I would make an unsalted portion for him and put it on the side of my plate. I guess now, I'm a little unsure of the quantities of food he should have. Yesterday, I filled his bowl in the morning with maybe 1/3c-1/2c of food. I didn't have a chance to go home during lunch, and he was extremely hungry last night, so I gave him an almond, a bit of walnut (is this too fatty for him? ), and then later some more veggies and gloop. This morning he actually woke me up from his squawking because he was hungry! He had never done that before. Also, only judging from his appearance, I think Kouki lost weight after I switched out the food that the breeder left me-he was constantly (over? )eating and paying attention to little other but food. That's when I realized I can only offer him a set quantity of food over a certain period of time. The breeder told me his food bowl needs to be full, that he needs to have access to food all day. But my bird was stressed out in his new environment at that time and I was scared he would develop a bad eating habit to cope with the stress, so I didn't consider the breeder's advice. As faras the gloop goes let him eat all of it that he wants for breakfast and for all day eating, then give him his regular ration of pellets or seed mix in the evening and remove it when he goes to bed. I would add the nuts if you are feeding a seed mix but not if feeding the pellets. Seeds and / or pellets all day long are not good for him, but gloop and fresh produce let him eat as much as he wants.